AirSign provides extensive aerial advertising coverage throughout all areas of Vermont. From beach aerial advertising to sporting events and over busy highways, we'll display your message to crowds in a way your audience will be certain to remember. Vermont is the only state in the New England side of the US to have no coastline along the Atlantic Ocean. The Green Mountain State has also been known for Lake Champlain and the Green Mountains. If you ever wondered where maple syrup is produced, Vermont is the leading producer in the country. 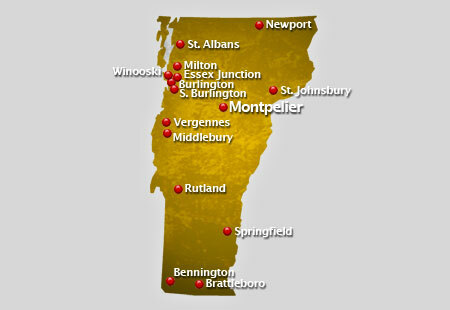 It is quite surprising though that two of the major cities in the state which are Montpelier, the capital and Burlington, the largest cities, may just be small cities in other states. Vermont enjoys warm humid summer and cold winters since they have a humid continental climate. Usually, they are known for the mud season in spring and the exceptionally cold winters. It a nice sight during the autumn season when you finally see sugar maple leaves falling on the hills of Vermont. Other popular places that would generate interest would be the Round Church in Richmond, the Traditional Dairy barn, the Green Mountain Meadow and the Winter Village in Waitsfield. As the residents are proud to declare, the State of Vermont has been named as one of the smartest states in the US. University of Vermont is known for the experimentation by George Marsh through the influence of John Dewey. To name a few of the colleges and universities in the state, we have the Vermont State College, University of Vermont, Bennington College, Burlington College and Norwich University. Crowds are an aerial advertiser's paradise! A typical flight over popular events or locations can result in as many as 8,000,000 impressions! Have us fly your aerial banner over the crowds in Vermont to put your message wherever you want, whenever you wish at the best value in mass marketing!